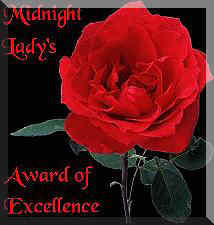 Thankyou Midnight Lady for this beautiful award! Thankyou Valerie for this award!! Please visit the Silver Light Site!! Thankyou Lady J for this award!! Please visit Lady J's Site! Please take the time to visit P.O.W.E.R, excellent site! Thank you!!! Please visit her site!! Please visit his site it is awesome! Thank you for this award, please visit Wiccan Awarness! !